You would have been hard pressed to find a face you did not recognize in the 30-player starting field of the PokerStars Caribbean Adventure Super High Roller. The price tag for admission was a cool $100,000, and two re-entries put a prize pool of more than $3 million up for grabs. 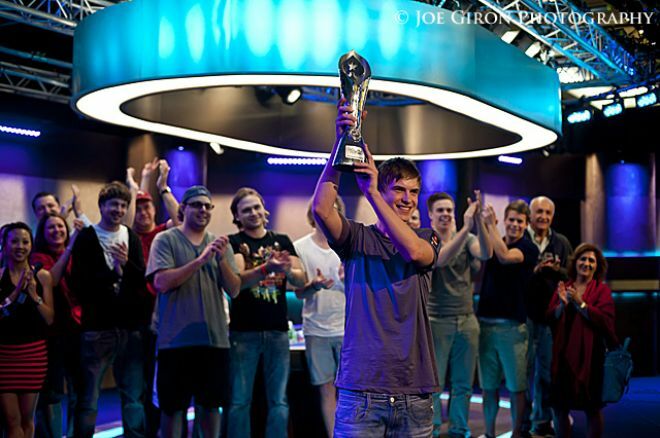 After three days of high-level play, Team PokerStars Pro Viktor "Islidur1" Blom was left sitting alone with the chips, the trophy, and $1.25 million. With eight players returning to the final table on Saturday and only five spots paying out, three men were forced to go home empty handed. The first of those was the fifth-place finisher in the 2011 Super High Roller, Humberto Brenes. The behatted Costa Rican came into the final table with a rubber shark head protecting the shortest stack in the room. Just a few minutes into play, Brenes three-bet shoved his into Galen Hall's , and the could not save the shark from extinction. Next to go was the next shortest stack as they began to fall out in order. Mike "Timex" McDonald took a stand with on a four-bet shove. It is hard to fault him for playing back at the aggressive Blom, but Blom had the dominating in his hand. McDonald was lucky on the flop, but the cruel landed on the river to seal his fate in seventh place. The remaining six players were perched on one of the largest bubbles imaginable. Zero dollars for sixth place; a quarter-million for fifth. The players and spectators hunkered down for what figured to be a long grind, but a cooler of a pot burst the bubble in less than a half hour. Scott Seiver was under 20 big blinds when he found and four-bet shoved. Hall was the three-bettor, and he snap-called with the superior and the chip-leading stack. There was no funny business on the board, and Seiver was relegated to the nearest barstool to shake off a disappointing exit. Three of the final five players were Team PokerStars Pros, but the pair of Canadians were the next two to exit. Daniel Negreanu couldn't get anything going at the final table, trending slowly downward until there was nothing left. With less than 30 big blinds, he shoved with , and he was likely content to flip for the double against Blom's . Negreanu mentioned that he'd pay $100,000 to pick a hand after the flop, and he would gladly have traded with Blom's pair after the brought three blanks. No help came on the turn or river, either, and Negreanu was dusted in fifth place. Just a few minutes later, Jonathan Duhamel and Blom went to war on a flop. The action left Duhamel all-in with and he was in front as the cards laid, but Blom's had plenty of outs. The turn was one of them, and Duhamel could not fill up to stay alive. The river was the last card of his day, and the 2010 WSOP Main Event champ added another $313,600 to his stat sheet with a fourth-place finish. Things were moving right along, and Blom's ascension to the chip lead figured to drive the action. Three-handed play lingered for hours with the two men mostly trading small blows and passing the blinds and antes around. Finally, Blom began to gain a foothold and take control of the match, mostly working on Hall's stack. Hall won the PCA Main Event in 2011, and he was two knockouts from making himself immortal at Atlantis, but it was not to be. With his stack whittled down to about 25 big blinds, Hall took his stand with pocket nines. Blom had a snap-calling hand though — — and five blanks on board sent Hall to the rail in third place and set the stage for the final duel. Dan Shak had been the chip leader through much of three-handed play, but Blom took over that top spot with that penultimate knockout. And Shak was next. The heads-up duel was largely one-sided and fairly brief, and the last hand saw Shak miss a combo draw with one card to come. His fell to Blom's on the board, and that was the end of the road for Shak. With that, Blom has etched his first major live title into the record books, conquering the Super High Roller to win $1,254,400, an enormous trophy, and Shamballa bracelet worth more than $20,000! Follow PokerNews on Twitter for up to the minute news.